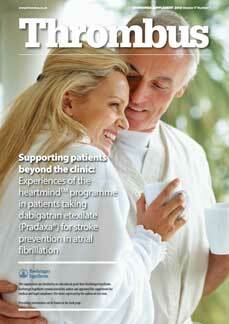 Prescribing information can be found on the back page of the supplement. Thrombus was previously supported by Bayer from 2014 to 2016, by Boehringer Ingelheim from 2009 to 2013, by sanofi-aventis from 2007 to 2008 and by Leo Pharma from 1998 to 2006. The data, opinions and statements appearing in the articles herein are those of the contributor(s) concerned; they are not necessarily endorsed by the sponsor, publisher, Editor or Editorial Board. Accordingly the sponsor, publisher, Editor and Editorial Board and their respective employees, officers and agents accept no liability for the consequences of any such inaccurate or misleading data, opinion or statement.